A couple of months ago, Ned from The Way of the Squirrel Books posted a call to other bloggers to do an interview. I had seen such calls for interviews before on other blogs, but had never actually done one of them. I was contemplating on editing the ‘about’ section on my blog anyway, but then thought this was also a great way of introducing readers with the person behind the blog. A good opportunity to share some insights into why I started blogging, some general thoughts on veganism (keeping in mind it is also an opportunity to reach people who may have never heard of veganism) and just some more general personal stuff. The original post is up here on Ned’s blog, The Way of the Squirrel books, reposted here with permission. Well, here we are again. Another Monday and another Meet and Greet. I love doing these but, as I’m so busy with work these days, struggle to squeeze them into my hectic schedule. Also, thanks to my PC deciding to treat the interview that was sent to me as a potential threat by forcing it through the lid of my spam box, this has been long overdue. Bill gates, what do you have against Vegans, eh? And…relax… so, today I am sitting down to chat with Trudi from https://brugesvegan.com Dear reader, I can’t recommend this blog enough. Their restaurant and food reviews are both mouth-wateringly enticing but also refreshingly honest. I even learned about some great places to eat here in London, a couple of which I’ve since tried, much to my belly’s satisfaction. So, without further ado I would like to welcome Trudi whose Blog I really, really enjoy. (Double really’s don’t work like double negatives by the way so by really, really I mean a lot, okay? Good). Trudi, firstly, I would like to apologise to you for the state of my virtual office. A redecorate has been long overdue and I’ve not been in here for some time I’m afraid, hence the dew running down the Windows™ of my virtual office. Ho-hum. Regardless, pull up a chair and make yourself comfy. I am Trudi, 46, living in Belgium with my husband and a flock of adopted animals. I have worked in academia (PhD), in a juvenile correctional facility and as a policy advisor, but am now no longer professionally engaged due to disability. Okay, so where on earth are you? (Let us know a little bit about the part of the world you live in). Just outside of Bruges, Belgium. Bruges is a “World Heritage Site” of the UNESCO, because of its historic/medieval city centre and many canals. It is also called ‘the Venice of the north’. We don’t live in the city itself, but on the countryside, with a big vegetable garden. I started blogging in Dutch in 2011, on graswortels.org (originally called Veggieleven). I also wanted to reach out to an English-speaking audience, so next to Graswortels.org (which translates as grassroots btw) I started The Bruges Vegan. That was three years ago, between Christmas and New Year of 2013 (so just celebrated the 3rd anniversary). Okay so, serious faces now, If you were a Muppet, which would it be and why? If you could be a Superhero, what would your superpower be and why? I started blogging because I wanted an independent space to share my thoughts on veganism and animal rights. There are of course other media outlets to do so, but those are often more volatile, or very ad hoc (facebook and twitter) or more visually focused (pinterest and Instagram). The Bruges Vegan is also sort of a personal archive for future reference. When people ask for suggestions for restaurants, recipes or shops, I can refer them to earlier blogposts, where they can find in-depth information. The focus of The Bruges Vegan is, obviously, veganism. Yeah, I guess I did kind of ask the obvious there…doh! Veganism is a philosophy and way of living which seeks to exclude, as far as is possible and practicable, all forms of exploitation of, and cruelty to, animals for food, clothing or any other purpose. So veganism is not just a ‘diet’, but is about taking the concept of justice beyond the human species barrier, and striving for justice for all, humans and other animals, in every aspect of life. Wow, if we ever get invaded by aliens, do you mind doing the talking for us? Just try not to mention Trump though, okay?! Diet is however an important part of anyone’s life (we all need to eat! ), and we do like to go dining out, so a lot of posts are reviews of restaurants we have visited (now already more than 100 restaurant reviews). But there are also other posts about our garden, homemade meals in our kitchen, reviews from events like vegan festivals or lectures, and some posts about animal rights. The posts about Remembrance day, (Armistice day, but not for the animals and The animals do not want our medals and statues) were shared more than a thousand times. I also write shop reviews and posts about vegan products like vegan caviar or Danish pastry. Is blogging for you a vocation or do you do it just for fun? A bit of both I guess. I used to write a lot in academia, and although what I am writing now is on a whole other level, analysing and reviewing comes pretty natural. Blogging should of course be fun, and one blogs because one enjoys sharing experiences with the world. If you consider writing and blogging a task or a chore, I don’t think you last very long as a blogger. That’s a really good point Trudi. If people are writing or blogging and it’s a chore, they really need to think about why they’re actually doing it in the first place. If you were stranded on a desert island, what luxury item would you take and why…and that goes to you….contestant number one. A media player stacked with music. Music can lift my spirits, and I don’t think I could go without it. I love a wide variety of music, from soul to metal, from blues to pop. But especially progressive rock (bands and artists like Porcupine Tree, Riverside, Transatlantic, Pink Floyd, Opeth, Steven Wilson, Genesis – the early years). I love listening to live recordings, and used to collect a lot of bootlegs. Okay, I’ve not actually heard of a couple of those but I will check them out as, if your music reviews are as good as your food reviews then these bands can’t be half bad! Do you think that your blog has changed or evolved since it began? Do you think that your blog/s are making a difference to your readers and/or do you feel as though you are connecting with them in any way? I hope so! I hope my blog contributes to breaking the stereotypical idea that a lot of non-vegans have of veganism: that vegans only eat salad and tomatoes (no we don’t! look at my post “Vegan, so what do you eat?”) and that vegans cannot go out for dinner. Some vegans also think dining out options are scarce, but I would like to think my blogposts can motivate them to also challenge non-vegan restaurants to cater for vegans (the more they ask, the more restaurants will take notice and offer it!). I also hope I can challenge the objectifying view a lot of people have on animals, that animals are not ours to use, eat or wear, with posts which are animal rights themed. I do find it a pity that I get more feedback from English speaking people than from fellow Belgians or Dutch, but I guess that is the downside of writing in English. What are your inspirations or interests outside of blogging? Taking care of our animal family, music (both listening to and trying to play, I am learning to play the drums), gardening, and conserving all the fresh produce from our garden (canning and drying). I also like to watch the tennis grand slams (on TV unfortunately, although we did attend the women’s final at Roland Garros one year). One of the many harvests from my veg garden last Summer! Good Lord, that looks stunning. Genuinely…Wow! Damn…I just want to go out and start digging my little garden up now…anyway, if you had the opportunity to go drinking with anyone from history, who would it be, where would you drink and why? This is a though one, so many people to choose. Meeting Leonardo da Vinci, painter, sculpture, architect, engineer – universal genius of his time, would be fascinating. He refused to eat animals out of the recognition of the cruelty inflicted upon them. Witnessing the majestic Renaissance buildings of Florence would be quite an experience too! It would be a challenge to discuss philosophy, politics, animal rights and the future with him. Maybe I could convince da Vinci to include some animal rights messages in his Sistine Chapel ceiling painting or other famous works. Or even write a book on animal rights. It could certainly change the course of history for billions of animals in future centuries. Have you found other bloggers that you would recommend? There are so many interesting blogs out there, again, it’s hard to choose just a few. I’m always interested in reading new stuff from Vegan Feminist Network, The Vegan Street Blog and There’s an Elephant in the Room blogs. I’m also glad to see new vegan blogs pop up all the time, and there are now literally thousands of vegan food blogs out there. There are on the other hand blogs that initially seemed interesting, but in which the blogger appeared to be racist or sexist, or where the blogger censures comments from people who respectfully disagree with their views (or the comments keep pending ‘awaiting moderation’). I stay away from those. Aliens? Do you think they exist? If so, threat or blessing? I do think somewhere in the universe there are places where other life forms exist. But maybe these life forms do not even fit under the definition of life that we humans have formulated, and their lives takes place in a totally different dimension which we cannot even grasp. I hope they live more peacefully together than we humans do on planet earth though. Do you use any other forms of social media? If so, which and how do you feel they compare? Both my Dutch blog Graswortels.org and BrugesVegan.com have their own facebook page here and here. I use Graswortels to post more general messages about veganism in the media and animal rights stuff. My instagram account has more personal photos: homemade food, pics from my garden, the occasional pic of our cats and donkeys, a snapshot of a city visit or a concert. I just recently started on Pinterest too, still finding my way there. Then I also tweet, where I post a combination of all of the above. In some periods I’m more active than others on any of these platforms, depending on time, energy and motivation. Is there anything that annoys or disappoints you about blogging/bloggers/readers? Commenting just to leave a comment, without anything sensible to say (like ‘mmmmm, yummie’). Adding the URL to their own blog in each comment (it is already included in the gravatar, no need to add it again). Discovering new blogs can be fun and interesting, but on the other hand some blogs are filled with pseudo-scientific nonsense, and a lot of people fall for that. Okay, final question so, games faces on please, what is your favourite children’s television character from your childhood? I used to watch a lot of Children’s BBC when growing up. I liked the drawings by Tony Hart and his character Morph. Is there anything else that you would like to say to any potential new readers of your blog? I hope you find my blog useful and inspiring, be it the restaurant reviews, the tour in my garden, my impressions from events we went to or other stuff I’ve written about. Enjoy having a look around! Would love to hear your feedback and if you have any questions, don’t hesitate to ask! Looking forward to the next interviews on your blog. Any more in the pipeline? 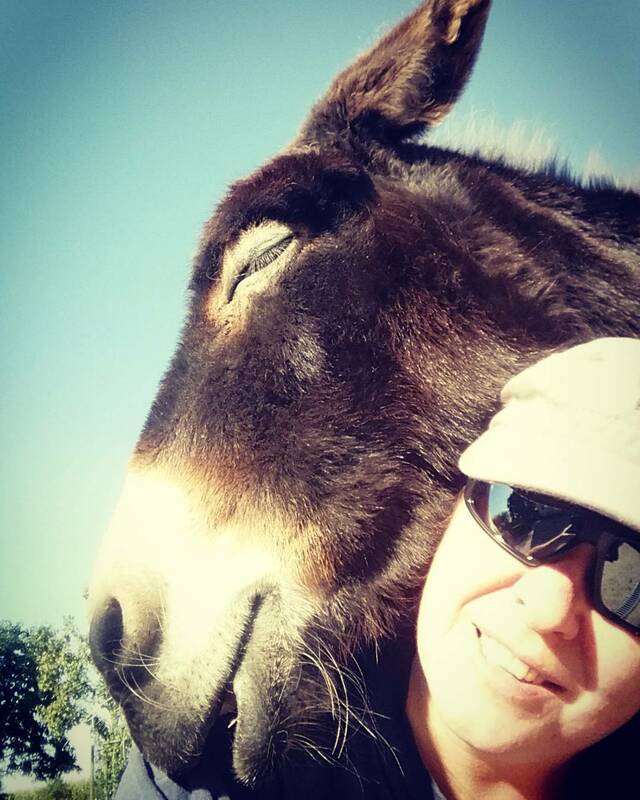 A good read Trudi with some super photos, especially the donkey. I like the cartoon too. What resonated me with was your view about holding comments in moderation. I can understand it when people have a very controversial blog, but when I’m reading book blogs, gardening blogs, travel blogs, photo blogs – and they get held in moderation? Just bizarre. I’ve written about abortion, sexism, feminism, vegetarian/veganism, and not moderated, although I have closed comments on a couple of posts when they got heated and personally insulting.